Winner of the National Book Award in 1985, White Noise is the story of Jack and Babette and their children from their six or so various marriages. They live in a college town where Jack is Professor of Hitler Studies (and conceals the fact that he does not speak a word of German), and Babette teaches posture and volunteers by reading from the tabloids to a group of elderly shut-ins. They are happy enough until a deadly toxic accident and Babette's addiction to an experimental drug make Jake question everything. White Noise is considered a postmodern classic and its unfolding of themes of consumerism, family and divorce, and technology as a deadly threat have attracted the attention of literary scholars since its publication. 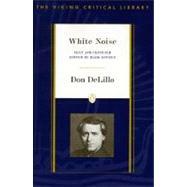 This Viking Critical Library edition, prepared by scholar Mark Osteen, is the only edition of White Noise that contains the entire text along with an extensive critical apparatus, including a critical introduction, selected essays on the author, the work and its themes, reviews, a chronology of DeLillo's life and work, a list of discussion topics, and a selected bibliography. Don DeLillo was born in 1936 in the Bronx, New York, and educated at Fordham University. He is the author of eleven novels, including White Noise (1985), which won the National Book Award, and Libra (1988), which won the Irish Times-Aer Lingus International Fiction Prize. His 1991 novel Mao II won the Pen/Faulkner Award. Other novels include Americana (1971), End Zone (1972), Running Dog (1978), and The Names (1982). His most recent novel is Underworld (1997). Don DeLillo is a member of the American Academy of Arts and Letters. "`I Never Set Out to Write an Apocalyptic Novel'"